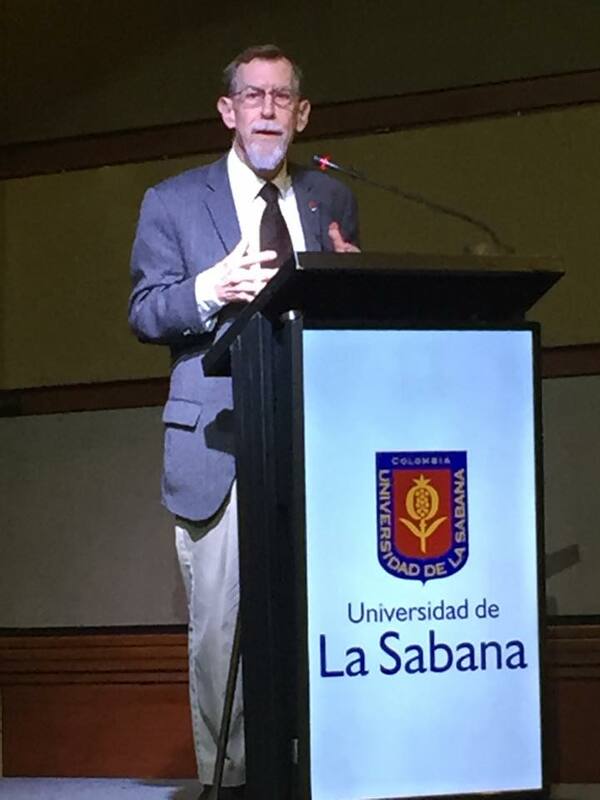 Eric McLuhan (1942 – 2018) passed away suddenly on Thursday, May 17, after losing consciousness in his hotel room in Bogota, Columbia after an academic visit to the Universidad de la Sabana in Chía, 7 km north of Bogota. He had been invited to deliver the inaugural lecture for the Doctorate in Communication program at the university. Titled “Media Ecology in the 21st Century”, it was very well-received. He was a scholar and a religious humanist, continuing his scholarship, research and writing until the end. His son Andrew who accompanied him tried but was unable to resuscitate him. Andrew announced today on his McLuhan Institute Facebook page that there would be a funeral for Eric McLuhan at 11:00 A.M. in Our Lady of Torcoroma in Bogotá, Colombia today. It is anticipated that the McLuhan family will hold a commemoration ceremony and celebration of Eric McLuhan’s life back in Canada. Dr. Eric McLuhan B.Sc., M.A., Ph.D.
An internationally-known and award-winning lecturer on communication and media, Dr. McLuhan has over 40 years’ teaching experience in subjects ranging from high-speed reading techniques to literature, communication theory, media, culture, and Egyptology. He has taught at many colleges and universities throughout the United States, Canada and abroad. In addition to co-authoring “ Laws of Media ” in 1988 and working closely for many years with his father, the late Marshall McLuhan, he has also been deeply involved in exploring media ecology and communications. In 1980, with Roger Davies, Dr. McLuhan developed the Thinking and Writing workshops, and together they founded McLuhan & Davies Communications, Inc., to help business professionals with their writing and editing skills. His research and thinking have been published in books, magazines, and journals covering topics such as media, communications, perception, and literature since 1964. He is currently researching the nature and structure of renaissances, including the one that now envelops us: the first global renaissance. His most recent published work includes The Sensus Communis – Synesthesia, and the Soul (BPS Books, 2015), Cynic Satire (Cambridge Scholars Publishing, 2015), and a third book in The Human Equation series (BPS Books, 2012). Several other books are currently in preparation. (Source: http://ericmcluhan.com/). I am so sorry to read of the sudden passing of Eric. He has always been fondly remembered by my children, particularly Vicky and Chris. I am sure it must be a shock to the family to happen suddenly. I remember your kindness to me when Rick died by accident. I know well how shocking it is with a sudden passing. My thoughts are with you. May Eric rest in peace. It is hard to imagine what the Marshall McLuhan legacy would have been like if it weren’t for Eric’s relentless work to see his father’s unpublished manuscripts to print and many of his unfinished works completed. But Eric also made significant contributions to media studies and its communities by his own deeply rooted scholarship and teaching and by his gentle, wise and creative presence in so many places and on so many occasions. He will be sorely missed. What a loss of a shining light. Oh, Eric… such a generous spirit, and true friend. I first reached out to you as a McLuhan fan and received in response a kind letter written in green ink. I still remember and will always the twinkle in your eye, the joy in your voice, the eternal optimist in you. But even moreso, your curiosity and breadth of wisdom and knowledge. You did your father more than proud and now we are all at a loss as to what to do without you. But we will soldier on, as the ideas… the laws of media… are more relevant every year. I will try sincerely to make the service. To feel your presence one more time and to wish you on your way. Blessings. It has been a true privilege knowing Eric McLuhan. He was not only a great popularizer of his father Marshall’s iconoclastic work, but also a highly original thinker and inspiring educator in his own right. A true humanist and visionary representing the best of Canada. As with all the replies, communicating with Eric was a graceful and enlivening experience. Having devoured all I could get my hands on of his fathers works, I wanted to gift the books and papers to a deserving student. Eric handled that for me in 2009. We corresponded since then and it has be a special part of my life. In gratitude.